It is for wildlife safaris in Tanzania. In Africa Tanzania surpasses all other Countries in the world. It is not a matter of argument, because a Wildlife safari in Tanzania offers far much more that any country can offer. This is attributed by the best wildlife National Parks that are found in Tanzania. Wildlife areas covers more than a quarter of the total land mass of the republic of Tanzania mainland and no other country in the world can match that. No other Country has ever dedicated more than a quarter of its land mass to wildlife conservation, but Tanzania has. In terms of wildlife safaris, Tanzania is home to most of the famous wildlife parks and reserves in the world. Selous Game reserve is the largest game reserve in the world but its fame is even overshadowed by the Serengeti National Park and Ngorongoro Crater. 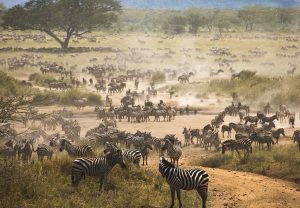 The largest and oldest national park in Tanzania, Serengeti is the home for the Great Wildebeests Migration that sees more than a million and a half herds of wildebeests accompanied by hundreds of thousands of Zebras and gazelles pound more than a thousand kilometers of the Savannah in search of greener pastures and water. Tarangire National Park and it is enormous herds of elephants and gigantic baobabs are always in competition with the small but very beautiful and evergreen Lake Manyara National Park. All these make up an unparalleled destination for a wildlife safari in Africa and that is why we say no other country in Africa can match Tanzania for wildlife safaris. Tanzania wildlife Safaris that we offer range from Luxury, Middle class and budget lodging safaris that involve staying in lodges and tented camps, but we offer also basic camping safaris. We have some sample safari packages on our website that you can choose from and they are all fully customizable in all aspects. We can replace the accommodation included with any standard that is compatible with your budget, and style. We can also handcraft a tailor-made wildlife safari package to suit your needs, ideas and budget and all you need to do is to contact us by email and let us know what wish to do in Tanzania for your wildlife safari.